The words or the language, as they are written or spoken, do not seem to play any role in my mechanism of thought. The psychical entities which seem to serve as elements in thought are certain signs and more or less clear images which can be “voluntarily” reproduced and combined. There is, of course, a certain connection between those elements and relevant logical concepts. It is also clear that the desire to arrive finally at logically connected concepts is the emotional basis of this rather vague play with the above mentioned elements. But taken from a psychological viewpoint, this combinatory play seems to be the essential feature in productive thought – before there is any connection with logical construction in words or other kinds of sign, which can be communicated to others. The above mentioned elements are, in my case, of visual and some of muscular type. Conventional words or other signs have to be sought for laboriously only in a secondary stage, when the mentioned associative play is sufficiently established and can be reproduced at will. According to what has been said, the play with the mentioned elements is aimed to be analogous to certain logical connections one is searching for. Combinatory play … essential feature in productive thought … analogous to certain logical connections one is searching for — these three phrases sum up pretty exactly the congitive training function of the HipBone / Sembl games. 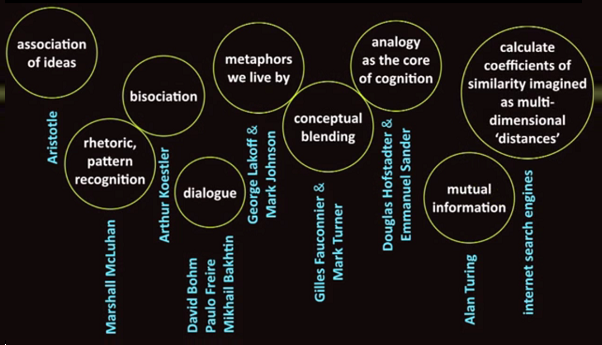 As I said earlier, I have to wonder how many of our analysts are deeply versed in this “combinatory play” of images and kinesthetic experiences, way below the threshold of conscious thought.